Infinity engineers designed the Kappa 62.11i coaxial speaker to produce impressive, accurate sound from a head-unit or amplifier capable of delivering up to 225 watts of power. This makes the Kappa 62.11i an ideal coaxial-speaker upgrade for systems powered with head-unit or factory amplifier power. They also handle the power from aftermarket amplifiers that are part of very high-fidelity aftermarket upgrades. Remember, great power-handling specifications increase reliability over the lifetime of the speaker, and that means that you’ll be enjoying the Kappa Series for many musical years. Kappa automotive speakers benefit from light and strong composite Injected Carbon Glass Matrix (iCGM) frames. Kappa Series speakers resist the environmental extremes that a moving car can encounter. They offer superior rigidity, even when mounted on uneven surfaces (common in car mounting locations), and exceptional damping of any resonances. The Infinity Kappa 62.11i coaxial speakers feature a vented motor assembly to let the voice coil breathe. It reduces the probability of power compression in systems playing loud over a long period of time. It means a more efficient use of amplifier power so that all the power delivered to the woofer is directed to the voice coil and not wasted as residual heat. The Plus One cone on the Kappa series offers more overall speaker-cone area than other speakers in its class. With an effective increase in cone area, the speaker radiates more air. Also, the carbon-injected cone material produces a lighter and stiffer cone. The result is a better low-frequency response and a greater ability to make those important, nearly tangible musical notes that people often associate with a larger speaker size. 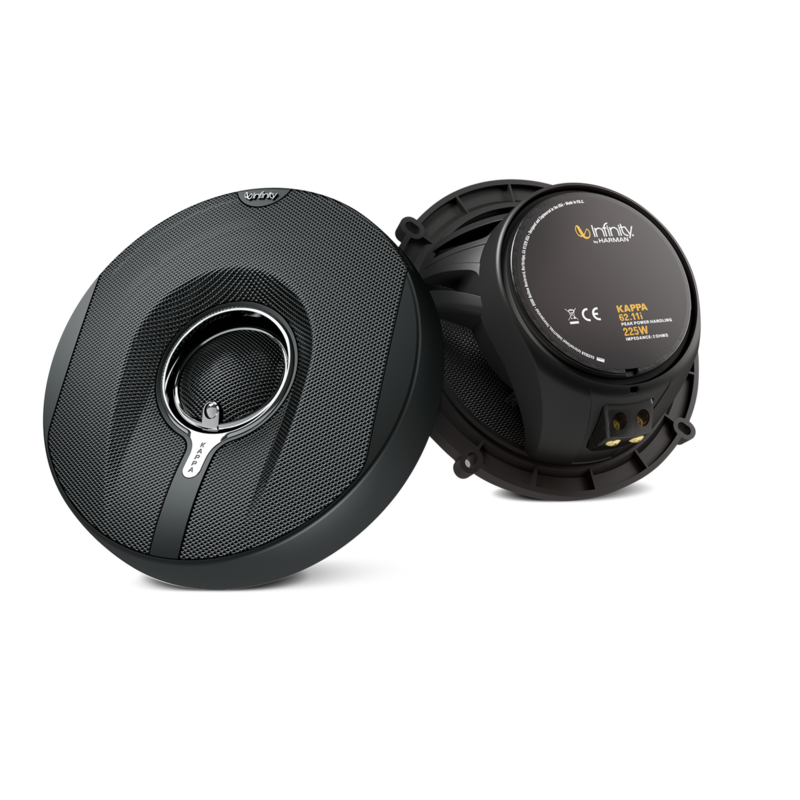 The 1-inch (25.4-millimeter), soft-dome, edge-driven fabric tweeter design in the Infinity Kappa tweeter increases power handling while reducing high-frequency distortion. An edge-driven tweeter also has better dispersion characteristics and allows for a lower crossover frequency than comparable tweeters of its size, which improves imaging. The result is improved vocals and clarity in music. There’s no sense in having a speaker play loud if it doesn’t sound clean, too. 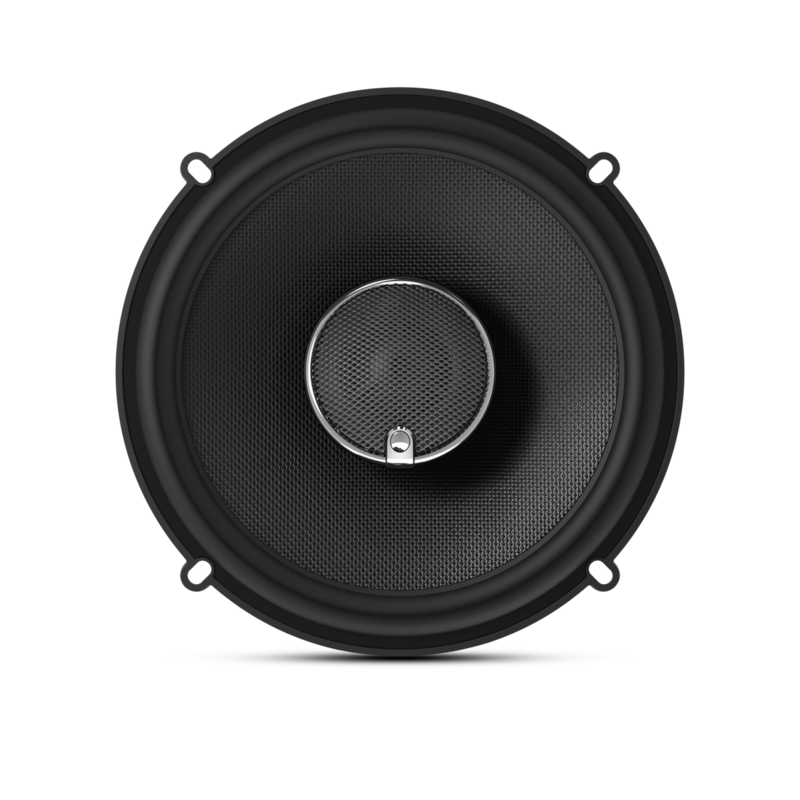 The 2-ohm nominal impedance of the Infinity Kappa 62.11i coaxial speakers allows compensation for any added resistance in thin factory-installed speaker wiring and provides more output than factory speakers in its class. A wide frequency response that extends to 25kHz helps compensate for speaker placement variations in the car and human hearing deficiencies in the high-frequency spectrum above 15kHz. The result is that the Infinity Kappa 62.11i coaxial speakers deliver more of the full-range frequency response that you associate with great sound. High sensitivity allows a wide range of power to have positive results without overdriving an audio system. With a sensitivity of 95 decibels at 2.83 volts/1 meter, the Infinity Kappa 62.11i coaxial speakers achieve excellent volume and musicality with as little as 5 watts RMS. This sensitivity means better performance overall with very moderate power, whether the speaker’s using a dedicated amplifier or not. The high sensitivity of the Kappa Series makes it ideal for upgrading a factory-installed system’s existing speakers with very noticeable fidelity improvements. The innovative UniPivot™ (U.S. patent no. 6,002,780) feature on the Kappa Series 62.11i coaxial speakers allows you to aim the tweeter at the listening location for better stereo imaging and high-frequency response at the listener’s ear. It offers even greater flexibility for off-axis mounting locations common in lower doors or kick-panel locations. The Infinity Kappa 62.11i coaxial speakers feature 0-decibel and +3-decibel settings to custom-tune higher frequencies. Custom tuning allows users to optimize the sound for different in-vehicle locations. You can easily adjust the tuning by pushing a button on the coaxially mounted tweeter. The passive filter components in the Infinity Kappa 62.11i coaxial speakers’ crossover network use only the best parts, including air-core inductors low-hysteresis polypropylene capacitors, and high-quality resistors. We have engineered them to require minimal parts for the desired filtering, which also means minimizing phase-related anomalies. Overall, the combination results in each Kappa Series speaker having a unique filter arrangement with minimal but very effective parts to achieve true high fidelity, clarity and performance. 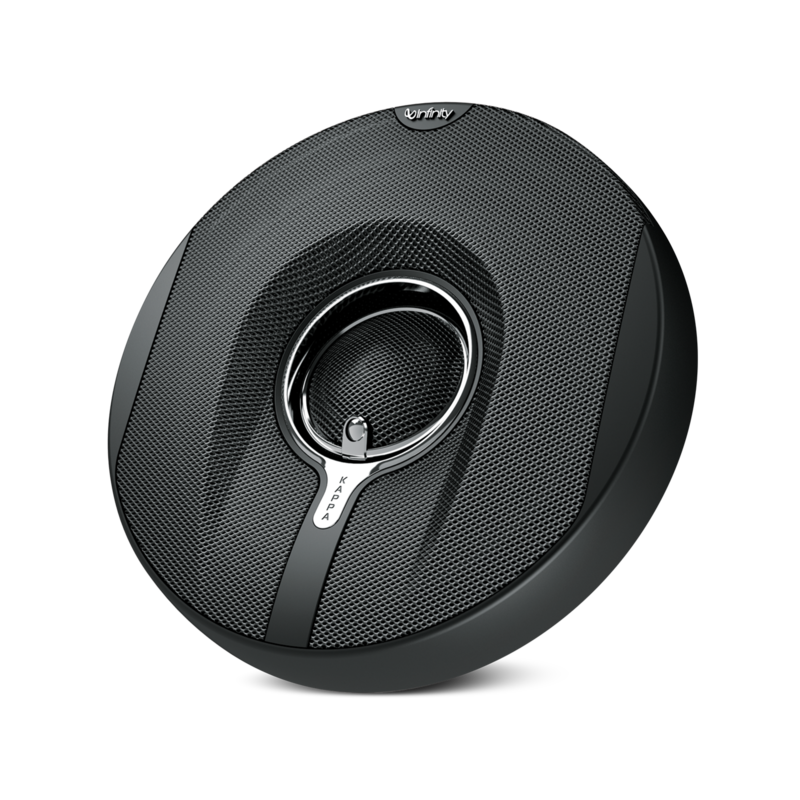 The Infinity Kappa 62.11i coaxial speakers feature a handsome appearance, with a soft rubber finish like the finish on many mobile-phone protective cases or the back of home A/V remotes. The beautiful chrome inserts on the grille match modern interiors, and there are no visible mounting screws. The grilles are an ideal complement to any installation location where the speakers are not already installed behind a factory-speaker location. Gold resists corrosion from normal automotive use, which makes it ideal for the connections on Infinity Kappa speakers. By adding screw terminals, the speakers ensure tight, long-term connections that also allow reliable connection with the large-gauge speaker cables common in high-end aftermarket installations. The Infinity brand has a distinguished pedigree of technological innovation in reference-quality audio reproduction, and much of it has gone into the Infinity Kappa 62.11i 6-1/2-inch (165-millimeter), two-way coaxial speakers. These speakers feature proprietary Injected Carbon Glass Matrix (iCGM) frames and patented formed-glass-fiber Plus One® (U.S. patent no. 7,548,631) woofer cones. Each of them has a 3/4-inch (20-millimeter), coaxially mounted UniPivot™ (U.S. patent number 6,002,780) tweeter with a soft-dome, edge-driven fabric diaphragm for improved power handling and wide high-frequency dispersion. The low-hysteresis polyproplyene capacitors and low-loss air-core inductors in the speaker’s passive filter networks are of ultrahigh quality. Even the soft-touch rubberized finish on the protective grilles represents the Infinity brand’s incredible attention to detail. The sound coming from the 62.11i speakers can change a dull morning commute into a flight of glorious music. Just try it and see – and hear. Kappa 62.11i wurde bewertet mit 5.0 von 5 von 3. Rated 5 von 5 von congwi aus Great Sound Had them installed last week and it really adds depth to the mids and trebles.